A tasetful and unique kit which lives up to the Gretsch name. It's good value for money at this level, too. Stylish. Unique. Versatile. Good value. The kit is finished in a two-tone Motor City Blue lacquer. Each piece of metalwork is triple chrome-plated. The latest addition to the Renown family celebrates the giants of the American automobile industry of the 1950s. This retro-stylised Renown '57 shell-pack takes us back to a time which gave us rock 'n' roll and, coincidentally, was also seen as the heyday for Gretsch, one of the world's most respected instrument manufacturers. "Under the 'hood', things are especially Gretsch-like." Sitting at the top end of the Gretsch range are the USA Custom, USA Custom QD and Signature kits, all of which are made in the USA. Whereas the Blackhawk starter sets, mid-range Catalina and the semi-pro Renown series are made in Taiwan. Like all drums in the Renown series, the Renown '57 is made to the same high standards as their USA counterparts and shares many similar features. The Renown drums are designed for the 'touring' drummer and come without the sizeable price tag for the privilege of owning a heritage-rich kit. Currently, the drum sizes available are as seen in the five-piece review set-up, comprising 10"x8" and 12"x9" mounted toms, 16"x16" floor tom, 22"x18" bass drum, 14"x6½" snare and, for a limited time, a colour-matched Gibraltar drum throne. Each drum features an embossed aluminium chevron dividing the two-tone blue and white Motor City Blue lacquer, and at the centre of each white portion sits an aluminium Gretsch logo. Each piece of metal work, including the die-cast rims, snare throw-off, mountings etc, has been triple chrome-plated. Gretsch suggests a break with standard drum design and construction, but, in essence, this simply refers to the finish and external features. Under the 'hood', things are especially Gretsch-like; here we see the familiar 'silver sealer', a rounded 30° bearing edge, 6-ply maple shells for the toms and bass drum, whereas the snare has 10 plies and the bearing edge is machined to 45°. Each of the toms and snare batters are fitted with the quality Evans G1 heads, while the bass drum has the excellent Emad batter featuring their external dampening system. The colour-matched blue hoops of the beefy 22"x18" bass drum feature rounded edges for a snug fit within each of the die-cast bass drum claws. The claw gaskets are one of the most effective designs we have seen. These are shaped to follow the contours of the bass drum rims. They also have an in-built sleeve through which the tension rod passes and isolates it from the claw itself. As on all the tension bolts in this kit, each of these have a nylon washer for smooth tensioning and to help avoid detuning. Though the kit is supplied with bass drum heads removed, it takes only a few minutes to attach them and for the drum to begin shaking the room. For their size, the suspended toms feel quite weighty but this is due to the GTS (RIMS-type) mounting system which has its fair share of metal and more of that lovely chrome. Attaching these toms and adjusting them to any playable angle is a piece of cake thanks to the excellent ball-and-socket mounts. It is possible to tune the suspended toms while on the mounts or at least do the final bit of tweaking as it is possible to turn both drums upside down while mounted, if required. The resonant heads of the toms are given just half a key-turn more than those of the batters, producing a subtle downward pitch bend and, after very little tweaking, the toms produce a pleasing tone maintained by a perfect balance of bite with the G1 heads and warmth from those maple shells. After the tensioning process, the floor tom goes up on those chunky 12.7mm legs and the memory locks keep it in position ready for the next gig. Experimenting with the snare clearly demonstrates how versatile this drum is; from a lower tension it gives a woody 'thwack', blip the tension bolts up a turn or two and this drum produces a raspy crack to rival some top-dollar snares. When judging the price tag, bear in mind this set-up does include an extremely good snare and a stool. 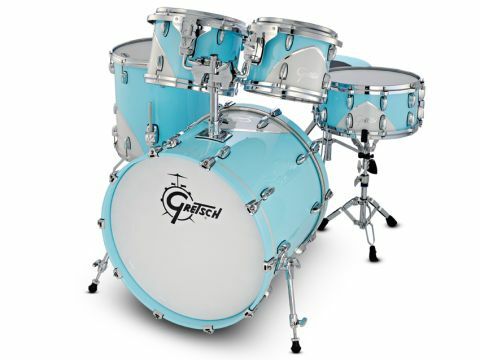 Gretsch have created a kit which is tasteful, unique and lives up to the name, and is good value for money at this level.